Summer in the South by Cathy Holton is one of the worst books I ever read. The main character Ava is nothing but "whine whine whine". The writing is full of cliches and is in need of editing: repetition of words and phrases alert! The story meanders and Ava goes from strong woman to whiner to just plain chick lit stereotype. I have never been so pissed off about (at?) a book in my entire life. In short, Ava wants to be a write but instead has a crummy job and crummy boyfriend in Chicago. 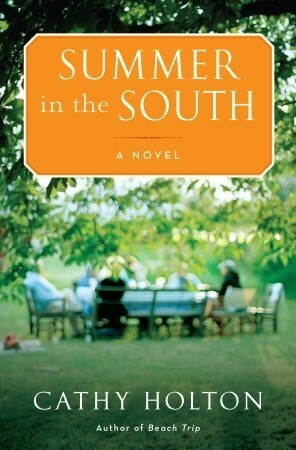 She keeps in contact with a college acquaintance Will (though how and way is vague and completely unbelievable) who just invites her to live with his aunts in Tennessee so she can write a book and she says yes. WTH? She moves in with these old ladies and then of course the books is full of all these quirky little stereotypical southern characters. Blah Blah Blah. Ava has a sleep disorder and she is either suffering hallucinations because of it or because the house is haunted. Ava keeps bringing up past family secrets and everyone in the South is all "hush hush" except for the town gossip. Ava snoops around and suddenly gets past her writers block and turns Will's family into her novel. In the middle of all this mess Ava, whose mother who was a hippie and never gave her a stable childhood and has died, learns that the man that's on her birth certificate isn't dead as her mother told her but alive and well in Michigan. Ava communicates with him and also finds out a whole bunch more of her OWN family secrets. Also, Will wants to make Ava his wife and she wants to be friends, and she's also falling in love with Will's estranged cousin who is the family black sheep named Jake. Blah blah blah.... all this crap is thrust into one book. It meandered and Ava is totally unfocused. What a hot mess of a book. Pathetic. I don't mind when an author leaves some things to the readers imagination but it feels like author Holton just got bored and gave up writing the story. And let me tell you something, I was bored reading and ready to give up around page 150. I persevered thinking I would get some answers and to find I was left with nothing really infuriated me as a reader. So were the apparitions Ava saw really a ghost or just part of her sleep disorder? Or was Josephine slowly poisoning her and the hallucinations part of that? Was Will going to kill her at the end? Did Will toss her room or was in a ghost? Who the hell was her father? Who the hell was her mother? How did the woman she called mom ever get her? Who will she end up with: Jake? Will? None? Will she go back to Chicago? Does Will kill her? WHAT THE HELL HAPPENS??? None of these questions are answered. Not a single one. I read about 360 pages of this crap to find no answers. I hated each and every single page of this wretched novel. Worst book ever, ever, ever. There's a free copy of this book being given away on Goodreads. Consider yourself a winner if you don't get a copy of this book! 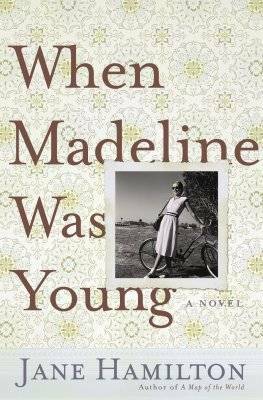 When Madeline was Young by Jane Hamilton was my first Nook book. It had nothing to do with the Nook but I didn't care for the book. It was one of those that had HUGE potential to be amazing, but it fell short. I wanted to like it- obviously if I was willing to actually pay good money at full price for a book- I really wanted to like it. The concept: Madeline is beautiful and she married the quiet, nerdy academic Aaron and them tragedy strikes during their first year of marriage. Madeline is in an accident and she is left with the mental abilities of a 5 or 6 year old. Instead of divorcing her, Aaron arranges for her care and then Aaron falls in love with the nurse. He divorces Madeline and marries the nurse and he and his second wife then care for Madeline like one of their own children. awesome idea, right? Well, in my review reading I don't know where I missed the part that the story is historical fiction. It takes place in the 1950s and then into the 1960s. This is significant only in the medical technology that is not available to Madeline at the time of the accident as well as people's response to such a famile makeup. Also, politics of the era are a huge part of one of the many subplots intersecting this story. Also, I must have glossed over the fact that the story isn't told by Aaron nor his second wife or even the childlike Madeline, but by Arron and his second wife's son, Mac. And the focus isn't really even on Madeline. Oh yeah, she's an integral part of the story obviously, but from the synopsis and reviews I read, I thought, for some reason, it would be Madeline's story and it was really Mac's story, his reflection on his life and how his strange family shaped who he became as an adult: a nice guy, a nice dad, a nice doctor, a nice son, a nice nephew, just a plain old... nice guy. The story jumps around all over the place from Mac's early childhood, to his present day life, to his early adult years, telling his story, Madeline's story, his mother's story, his aunt's story, his sister's story... It bops around and is often hard to follow because we have a flashback within a flashback. I love my Nook but this is a book that had I had a paper book with pages, I would've flipped back and forth to refresh my memory of the characters and who was doing what with whom because of the jumping around story telling style. I expected something completely differently obviously. Instead I got a sort of coming of age story rather than a tale of a woman child's survival. I've read better and much worse but I'm not really sure I would recommend this to anyone else. I would recommend a Nook, though! I'm not sure what I'm going to do with this blog. I KNOW I don't want to write a review of every single book I read this year. I know I don't want to do that at all. I was thinking I might post once a week a list of what I read that week and make pithy little comments like I'm usually apt to do. I also belong to a book club in real life. I thought I could make a feature of this blog that once a month I'll recap our book club meetings- including the salacious gossip! So, who knows what 2012 will bring here so stay tuned and see! I did a movie re-cap a few days ago so I guess it's time for a book re-cap. I usually do this in January, part of my New Year's Resolutions, to summarize the books I read last year and then to make some projections for the new year. I can't believe I've done neither. So, a few months late, here's my 2011 book reading experience in summary. The Double Bind by Chris Bohjalian, with its twist ending and its tie to The Great Gatsby. And I thought Ella Minnow Pea was super cute, about the island of people to started banning certain letters from the alphabet. Everlost, a YA book about a land of children who died in this world but are still alive in another one. And it wasn't creepy! The Paris Wife is probably my favorite book for 2011. It's a piece of historical fiction about Hemingway and his first wife and their time in Paris. State of Wonder is probably second favorite book of the year. It's a wonderful tale of a trip into the Amazon and science and the characters are amazing, the words are textured and rich. I loved it! Burnt Mountain is a strong novel with complex characters and storylines that all run together to make this story come alive. Honorable mentions: Case Histories, a thriller that's Cold Case TV style but with one PI instead of the police; Shiver, the first book in a YA trilogy about a girl and a wolf and a boy; Mourning Gloria, part of the China Bayles series of mysteries which is always a favorite of mine; The Midwife's Confession about people left in Noelle's life after he suicide and her friends and family discover who she really was after her death; The Ninth Wife is about a woman who is proposed to and discovers that if she says yes then she'll be the 9th wife so she goes on a journey to discover if this would be a mistake or not (and it's not chick lit); Sing You Home by Jodi Picoult who is one of my fav author's ever; Sisterhood Everlasting, which is the latest and probably the last in the Traveling Pants novels which finds all the girls now 29 year old women; Then Came You by another fav author Jennifer Weiner who explores woman and child baring and family make ups; and finally, Smokin' Seventeen about bounty hunter Stephanie Plum and her crazy crew in this mystery series. I didn't like Room. Reading an entire novel in the voice of a 6 year old was enough to make me scream. The Particular Sadness of Lemon Cake had such potential to be an AMAZING book. A girl can "taste" the feelings and emotions of the people who make the food she eats. This could've been astounding but instead it sucked. The End of Everything- creepy, creepy book. Last Night at Chateau Marmont- stupid chick lit and i want Lauren Weisberger, author, to write another smart, sassy, grab you by the hair novel again like Devil Wears Prada and she doesn't in this one. Not even close. I would rather have worked for the Devil without Prada for a year than have read this book. Here's my other dilemma. I'm looking at titles of books I read that I either gave 4 out of 5 stars on my Goodreads account OR I gave a high B or even an A on my books blog and without reading my own review, I can't remember what it was about. How could I have liked a book so much that I rated/ ranked it that high but here I am months later and I can't remember a single detail. In all honesty, if I wasn't looking at my own list, I probably wouldn't even remember reading it at all!!! These books would be The Peach Keeper, Red Hook Road, and Friendship Bread. WTH? I don't remember any of these. If I rated them so high, shouldn't I be thinking these are the best books of 2011??????? Ack! I also, occasionally, pick a theme through the year or get on a certain kick whether it be an author, a subject, a genre. At one point in 2011, I tried to read as many books as I could IN A ROW with a female in the title: Gatsby's Girl, The Reliable Wife, The Zookeeper's Wife, The Postmistress, The Paris Wife, The Weird Sisters, and The Bird Sisters. And ironically enough, all of these had something else in common: they all took place during WWII or right before or after WWII and WWII influenced the storyline. So that was my 2011 reading year. I miss 2010 when I read astounding books so I have high hopes that 2012 is better!